supported by our dexterous team and hi-tech infrastructure, we are bringing forward an optimum quality array of ss chinese cooking range. 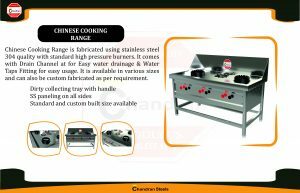 Established with quality as the top focus, chandran steels , the industry-leading Manufacturer and Wholesaler firm has been serving the industry with highly demanded Commercial Kitchen and Refrigeration Equipment since 2000. There is a reason we are known nationwide as the foremost company for quality products such as Commercial Kitchen Equipment, Restaurant Kitchen Equipments, and Kitchen Refrigerators. It’s because we harness superior production engineering to develop the finest grade kitchen equipment that is widely appreciated for its corrosion resistance finish, superior functionality, energy saving performance, and maintenance-free long life. Moreover, what makes us look beyond the bottom line is our dedicated efforts to provide expert consultation services for kitchen equipment layout. Put simply, utmost level of customer satisfaction is our mission. We believe that developing the best quality kitchen equipment means we must work closely with our clients to understand their complex and evolving needs. This is why; we invest more resources in strengthening our team that strives to grasp the ongoing market trends and latest consumer needs. It helped us to serve with best quality commercial kitchen equipment to renowned hotels, restaurants, industrial kitchens, base kitchens, and fast food joints in the country. We take pride that our developed equipment plays a significant role in the business operations of our prestigious clients.